I have always been pretty healthy, and my hospital experience had been limited to the labor and delivery of my three kids. I’ve never even had a cavity, let alone major surgery. So when I entered the hospital early on the morning of December 7 to undergo bilateral mastectomies, there were some surprises. My first big shock of the day was when the nurse came to take me to the OR for surgery—and she MADE ME WALK THERE! The movies always show patients being wheeled down the hall on a gurney while their loved ones hold their hands and profess their never-ending devotion. My experience was more like a scene out of “The Green Mile.” All I needed was Tom Hanks marching behind me yelling, “Cancer patient walking!” while I shuffled off in my sad little blue gown and green surgical socks. Also, they took my glasses. I’m blind as a bat, so I couldn’t see where I was going and almost ran down my surgeon when I walked full steam into the OR. The final insult: they made me hop up on the operating table myself! After all that I half expected them to ask me to hold the clamps for them during cancer surgery. Everyone knows you can’t eat or drink after midnight the day of your surgery, so that was not a shock. But I’m a two-cup-a-morning girl, and I wasn’t prepared for the serious caffeine withdrawal I felt when I walked into the OR. So, when the anesthesiologist announced that he was giving me some drugs to put me to sleep, a java-deprived crank inside me snapped, “It’s about damn time!” I thought my surgeon was going to fall over laughing. I may have to mainline a latte before my next procedure. 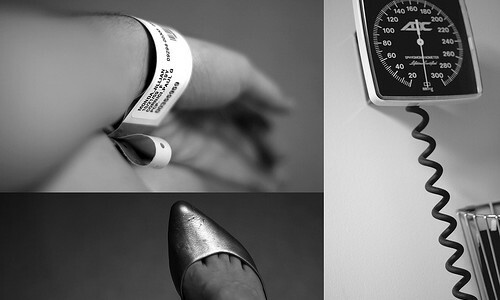 While I wasn’t prepared for all the surprises of surgery, I had prepared myself for this to be a horrible experience. That it wasn’t turned out to be the last, and best, surprise. First of all, pathology came back showing all of the cancer had been removed. I was also blessed with gifted physicians who worked hard to leave me with as little physical and emotional scars as possible. I had amazing nurses who took great care of me while allowing me to hang on to my dignity. And due to the love and support I received from my family and friends, I never for a single moment felt alone. Having a mastectomy is not an experience I would wish upon my worst enemy, but I can at least tell anyone facing the surgery: “It’s not as bad as you think.” Everyday I get a little stronger and a little more ready to face the next challenge. Everyday the strange and painful memory of my surgery fades a bit, and I am confident in time what will endure is that feeling of love. Well, and probably the memory of the other crazy lady in recovery.